Thursday: Suite 200 was open for registration and socializing. Friday: The Bus Trip was a huge success. Jack Sterling, a local guide and resident of Jim Thorpe, provided an informative and detailed account of the area. 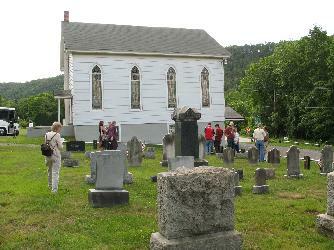 The first stop was the Big Creek Cemetery near E. Wiessport, adjacent to St. Paul's Church. The first burial was before 1800, originally a family burial ground, probably for the Solt Family. Jacob and Anna Maria (Dreisbach) Arner were probably founding members of St. Paul's Church, with the Solt family. Clarence Getz met us at the Big Creek Cemetery and we followed him to the Dreisbach Store. He opened the store for us to wander through. 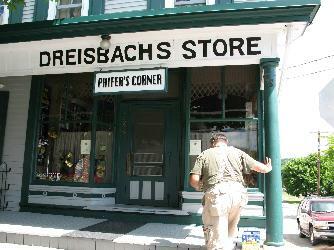 He lives in one part of the building and plans to restore the store and open it up as a museum. The journey continued on to the Union Hill Cemetery, Weissport, Carbon Co., Pennsylvania. 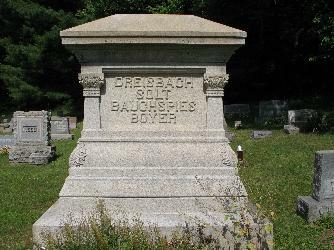 There are many Dreisbachs buried here. Melanie Dresbach was able to find a stone she had been searching for. The bus took us on a steep and winding road up the mountain to Flagstaff. I was unsure at times that the bus would make it. We all took many pictures from the observation deck off the Flagstaff ballroom. The view is spectacular. If you looked to the east you saw the mountain that resembles a Sleeping Bear, from which the Mauch Chunk name is derived. Mauch Chunk is Indian for Sleeping Bear. 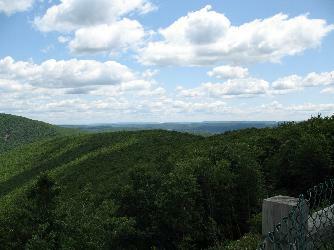 And if you look down, a 1000 feet below is Jim Thorpe, formerly Mauch Chunk. 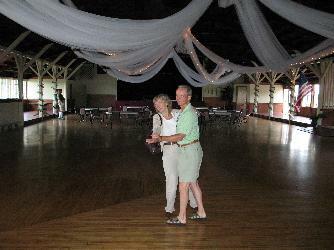 A couple family members danced to the sound of Jimmy Dorsey�s Band. Frank Sinatra also sang here. We had lunch at Gallo�s Pub and Grill. The waitresses said they had seen bears in the area, but alas I did not see them. We loaded into the bus for a trip down the other side of the mountain. The road wound along Mauch Chunks� unique switchback, a railed road. This was how the coal was transported down to the canal. It was also used to transport people up the eighteen miles to the top of the mountain to Flagstaff. It is considered America�s First Roller Coaster. As we entered the town of Jim Thorpe, I was not sure the bus would be able to get down the narrow streets, but our driver was good. 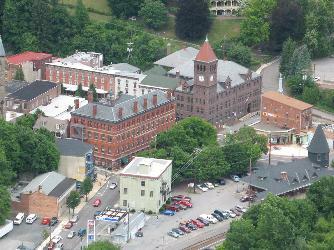 Jim Thorpe, formerly Mauch Chunk, is nestled in a spectacular valley along the Lehigh River Gorge. We were met by Jack Sterling’s wife, Susan, and split up into two groups for a walking tour. As we leave the historic Lehigh Valley Railroad Station, you are transported back in time. The lanes are narrow, with the houses built right up to the street, a scene right out of a Swiss Village, if it were not for the cars. All the buildings are unique in their Victorian architecture. 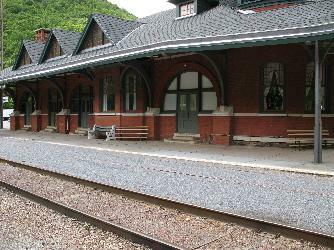 During the heyday of Mauch Chunk there were 13 millionaires and seven grand hotels. At this time only one hotel remains, now called the Inn at Jim Thorpe, it was once the American Hotel. There are beautiful mansions on the hills that are open for tourists. Fortunes were made from the coal, transportation of the coal and tourism. 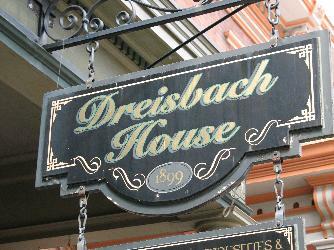 The owner of the Dreisbach House gave us a tour of her house. Her store, in the lower front half, offers an eclectic mix of dishware, books, vintage apparel and jewelry, along with new costume jewelry. It is open year-round on the weekends. She is in the process of remodeling the rest of the house and what she had finished was beautiful. It is nice to see that the Dreisbach House is being lovingly care for. 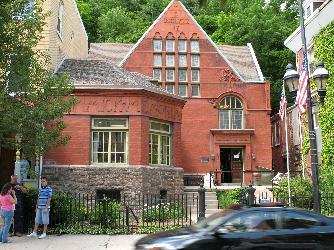 We continued down the street on our tour, the next stop was at the Dimmick Memorial Library. Milton Dimmick, son of Milo Dimmick a local lawyer and congressman, died in 1884 at the age of 36 and left money to establish a library in the name of his family. The library was built in the Jacobean style and was opened to the public on October 1st, 1890. In 1979, a fire gutted the library. The Dimmick Memorial Library was restored and rededicated June 19, 1982. The tour stopped at Jim Thorpe’s memorial built by the townspeople on a hill on the east side of town. There is a seven foot bronze statue of Jim Thorpe and display cases that tell about his life and achievements. Jim Thorpe is considered the greatest athlete of the 20th Century. A man that exempliflied the pure joy to be gained through the spirit of competition. The end of a perfect day was capped off by a formal outdoor Bar-b-que. We started with a game of Get Acquainted Bingo. Who has baked a “funny cake”? It gave us all a chance to meet new cousins. There was lots of food. Plus two kegs of beer, one birch beer (non-alcoholic) and one of real beer.